How much are your BMO Rewards points worth? It is important to note that BMO "Rewards" and "Points" are the same and will be used interchangeably. The dollar value of a BMO Rewards point remains constant at $0.007, as you receive a $1.00 credit for every 140 points. Yes, you can pay for any applicable taxes, fees, and surcharges using points Yes, points are worth $0.007 each. No, points are not transferable. Yes, there are many popular airlines to choose from including Air Canada, West Jet, Delta Airlines, and United Airlines. No, points must be redeemed prior to purchase. No, there is no expiration date while you are an active member. You have up to 90 days to redeem your points upon closure of the account. BMO rewards are only redeemable on the BMO website or by calling BMO Rewards Centre($29.95 booking fee via phone). This limits the flexibilty of the program especially compared to other rewards programs which allow you to book travel through a third party website and pay for it with points at a later date. When using your BMO Rewards points, there are no blackout periods so you can travel at any time of the year, even during peak periods. Your travel arrangements are treated like any other reservation, meaning you’re not limited to rewards seats on airlines or to any particular airline or hotel. BMO accepts last minute travel bookings up to 2 days before departure. BMO Rewards points can be used to cover all applicable taxes and fees. When redeeming for travel using the BMO Rewards program it is advised that you book the travel yourself, without the assistance of their Rewards Centre, to avoid paying the $29.95 booking fee via the phone. Besides that, there is no magic formula for maximizng the value of your BMO Rewards points. It really depends on the credit card you use and the rate at which your points accumulate. The best way to maximize how many BMO Reward points you can earn is by using the credit card that rewards you the most points. For example, when using the BMO World Elite MasterCard, you receive 2 or 3 points for every dollar spent, depending the category. When you redeem points for a flight you are receiving a 2.1% return, which is incredible value for a rewards card. 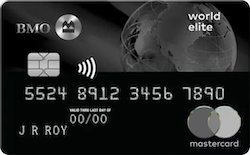 The BMO World Elite MasterCard is one of the top travel rewards cards in Canada and is definitely worth considering if you’re looking to maximize the value of your BMO Rewards points.